Space. Style. Serenity. Majestic trees tower over an acre of green space and an estate that marks entry to the Town of Highland Park. 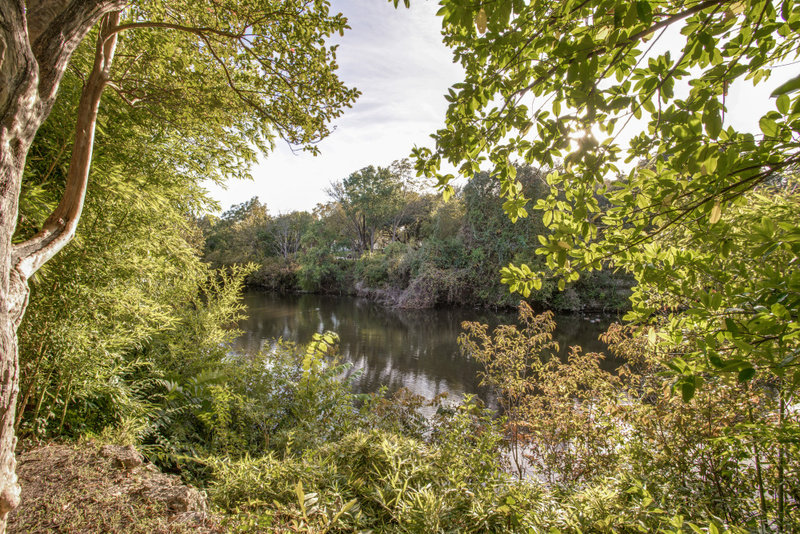 For the first time in over a century, this coveted setting next to legendary Turtle Creek is offered on the residential market. Traditional in appeal, the 8,331 square foot home hallmark is the custom wrought iron balustrade, framing the front entry and veranda, with the same classic architectural motif on the rear balcony. The distinctive porte cochere offers sheltered entry as well as covered parking. Marble flooring defines the entry, with a graceful stairway leading through an elliptical opening to the second level. First floor living features a living room with fireplace infused with natural light through floor to ceiling multipane windows, accenting the patina of hardwood flooring. An adjacent library's windows afford views of the grounds, nature at its finest. A paneled den and its fireplace is surrounded by shelves with French doors leading outside. Chevron pattern hardwoods emphasize the spatial feeling in the dining room with its natural light and soft cove lighting. The paneled kitchen is equipped as an estate should be and has space for informal dining. Luxury living continues on the second level, also reached by elevator. The master suite has his and hers master baths with jet tub, walk in showers, makeup area and room-size closets with drawers and hang space, plus access to the upstairs balcony overlooking the expansive grounds. An additional bedroom or second master includes a large sitting area. Two more bedrooms share a Jack and Jill bath. An upstairs family room with fireplace can become a bedroom or game room, with adjacent study/flex space. In 1906, Judge Nelson Phillips moved to Dallas from Hillsboro and lived on this site until appointment to the Texas Supreme Court. In 1913, the Phillips couple sold the property to W.O. Connor, the first elected Mayor of Highland Park. In 1940, Connor's widow conveyed the property to her daughter, Dorothy Connor Austin and son Brevard Connor. In 1941, they conveyed the west 1.07 acres to Frank and Helen Austin. Around this time the original home was replaced by the current structure. In 1943, the remaining east .56 acre was conveyed to the Austins. The magnificent home was renovated and enlarged in 2005.